The above info came from Lone Wolf, and was edited by yours truly (contact me). The image came from Enoki Films. Alice Academy is a school for special children with special abilities. Mikan Sakura is your typical small-town, clumsy little girl... until her best friend Hotaru Imai transferred to another school. Hotaru only sent one letter to Mikan for the past 6 months. Worried, Mikan went to Tokyo to look for Hotaru's new school. When she got there, two guys where hanging around the school, and they thought she was an Alice, and were about to kidnap her but a teacher from Alice Academy stepped up and used his Alice to save Mikan. He also tried to use his Alice on Mikan, but to his surprise it didn't work. So he asked Mikan to come with him to the academy, but unfortunately someone interrupted by blowing up the walls of the school... a guy with a black mask... a student in the academy. 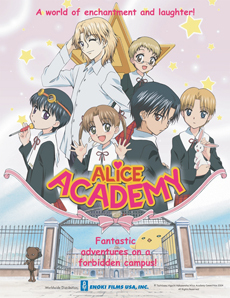 Alice Academy isn't a secret organization, but in fact it is just a school for geniuses as they call it. The above description came from Lone Wolf, and was edited by yours truly (contact me).